The main reason people come to us for a new kitchen is theirs simply can’t accommodate the things they need to put in it. Sometimes simply not having a shelf high enough to stand a cereal box up is enough to make a woman go mad! We have even seen countertop appliances(Mixers, Blenders, Juicers, Crock pots.. ect.) stored in the basement, attic and linen closets. Have you ever had to lug your crock pot up from the basement because you wanna make an easy meal tonight? 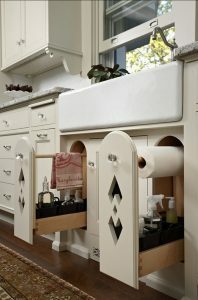 Well in the wonderful word of cabinetry storage solutions have came and are only improving! Dry Goods is always an issue. Think about it, you get home and start transferring to either a container or a zip lock bag so it stays dry and fresh and you still have to find somewhere to store it. 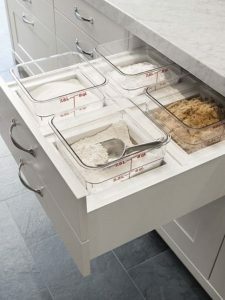 Giving it a designated container and spot in your kitchen eliminates the digging for a bag later or the occasional drop sending your good across the floor and a broom and dustpan never gets it all. KitchenAid Mixers popularity are on the rise because of how versatile it is. 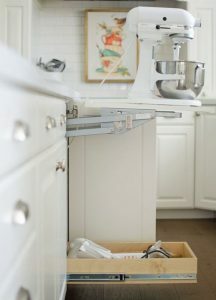 The down side of this mixer is the size and weight causing many owners to simply leave it on the countertop. 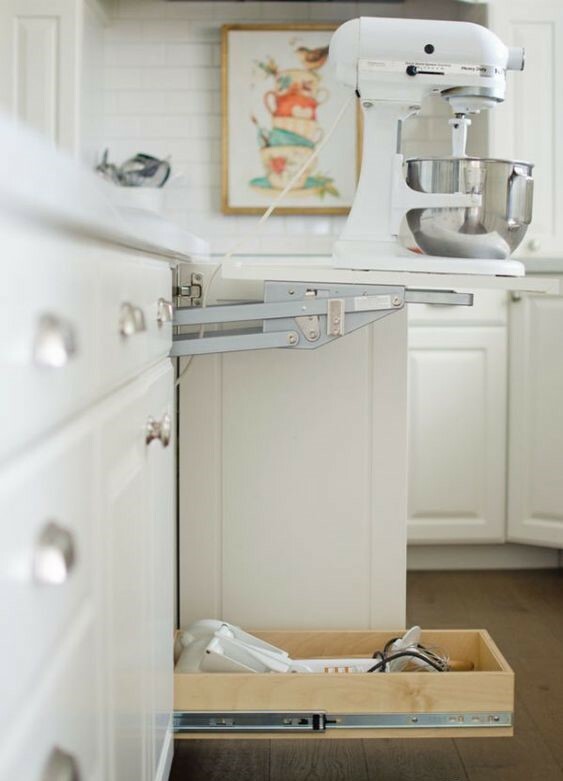 The cabinet hold your KitchenAid Mixer and is recommended to have an outlet added to the inside of the cabinet to you never have to plug and unplug it. The bottom hold all your attachments and pulls out completely so your not in a dark cabinet digging. Here at Modern Home Kitchen and bath we strive to give you what you want and so much more. Hidden storage is a dream come true. Everything has a place and that place is not seen. 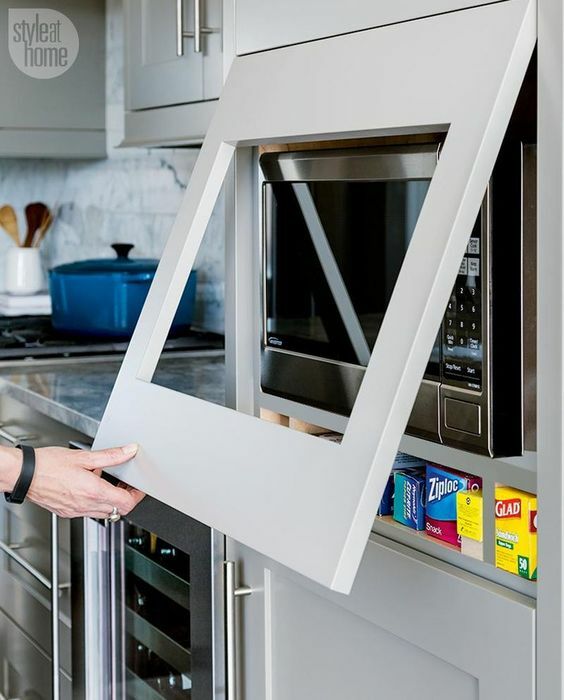 Check out these hidden storage solution. 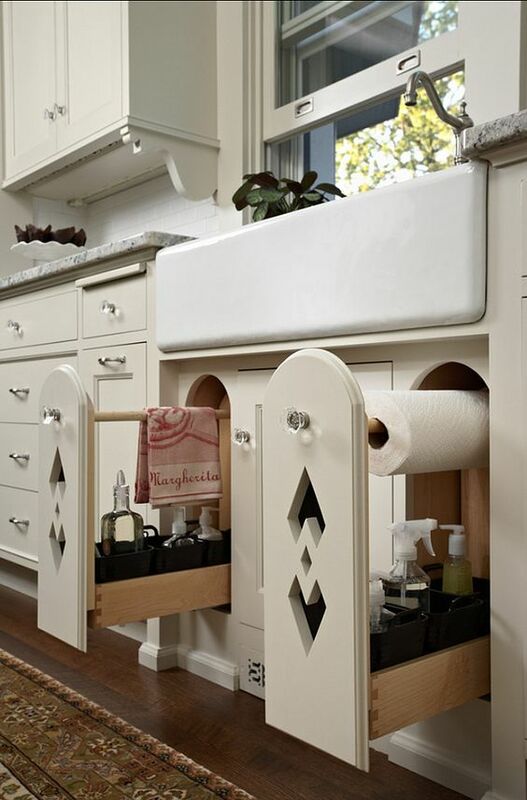 Come back later this week and see more storage solutions! Love the microwave storage. Thinking everyone needs this..